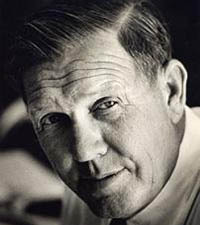 SEMA Hall of Fame - Bill France Sr., 2012, NASCAR. William Henry Getty France Sr. is remembered throughout the world as the founder of NASCAR, the most successful stock-car racing series on earth. Born in Washington, D.C., on September 26, 1909, France developed an interest in racing early on. As a teenager, he played hookie from school to take the family Ford Model T to a local board track near his Laurel, Maryland, home. Legend has it he would while the day away doing laps at the track until the last possible moment, then race home before his father could get there and discover what he had actually been up to. As a young man, France found a job at a local car shop, and then operated his own service station before eventually working his way to Daytona Beach, Florida, opening an auto repair shop there in the early ’30s. By 1936, he was lending his compelling presence to efforts to lay out the locality’s first beach/road course and, as a racer, finished fifth in the course’s inaugural competition. Two years later, he was assisting with the promotion of the races on the sands. France quickly became known as “Big Bill,” due as much to his 6-ft. 5-in. stature as the big thinking and unfaltering confidence that earned him a towering place in motorsports history. Throughout his early career as a racer and fledgling promoter, he experienced firsthand the challenges of the racing business, from recruiting drivers and spreading the word to creating tracks, hiring ticket-takers and generating profits. Although World War II interrupted much of this work, he promptly resumed when peacetime returned. Along the way, he developed the conviction that if stock-car racing was ever to truly succeed, it needed a single, firmly governed sanctioning body. In 1947, France gathered a group of race promoters, drivers and mechanics for a now-famous meeting at the Streamline Hotel on road A1A in Daytona Beach, a structure that stands to this day as a racing landmark. Together, the group established the National Association for Stock Car Auto Racing (NASCAR), with France as president. They officially incorporated the organization within a year, and more than 14,000 fans attended the first NASCAR event on the Daytona Beach road/beach course in February of 1948. 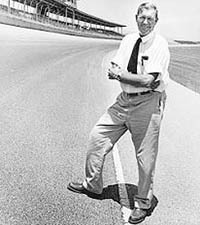 Under Big Bill’s leadership NASCAR saw fast-paced development throughout the ’50s and ’60s. He built two superspeedways that came to personify the sport—the 2.5-mi. Daytona International and the 2.66-mi. Talladega (Alabama). He also founded the International Speedway Corp. (ISC) to operate the two tracks plus others involved in NASCAR’s three national series, the NASCAR Sprint Cup, the NASCAR Nationwide Series and the NASCAR Camping World Truck Series. 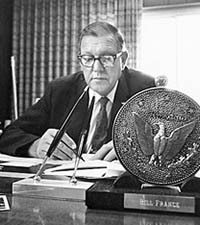 In 1972, he stepped down from his NASCAR presidency, handing the reins over to son William C. France. However, he continued for several years as a consultant and ISC chairman/president. Not surprisingly, France achieved many lifetime honors, including induction into the Florida Sports Hall of Fame, the International Motorsports Hall of Fame, the National Motorsports Press Association Hall of Fame and the American Auto Racing Writers and Broadcaster Association Hall of Fame. Big Bill died of natural causes on June 7, 1992, leaving a larger-than-life legacy. In May of 2010, he was honored again posthumously as one of five initial NASCAR Hall of Fame inductees. His induction into SEMA’s Hall of Fame pays homage not only to his many accomplishments, but also to the racing heritage that continues to inspire and fuel the performance aftermarket.